Turn on lights before you enter your home! 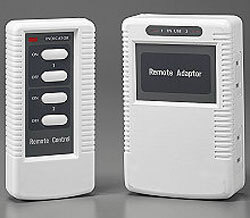 Comes with 1 remote control (battery included) that controls 2 appliances on 1 outlet individually. Simply plug each unit into a wall outlet then the lamp or other appliance into that switch. Approximate range is 100 feet. Be the first to hear about new products and important safety tips.